Located at the intersection of North Michigan Avenue and the Chicago River, Pioneer Square was the home of Jean Baptiste Point du Sable, Chicago first permanent settler. Since then, it has been surrounded by some of the city’s most iconic architecture – the Tribune Tower, the Wrigley Building, the Mies’s AMA Plaza, Marina City, and the Trump Tower. 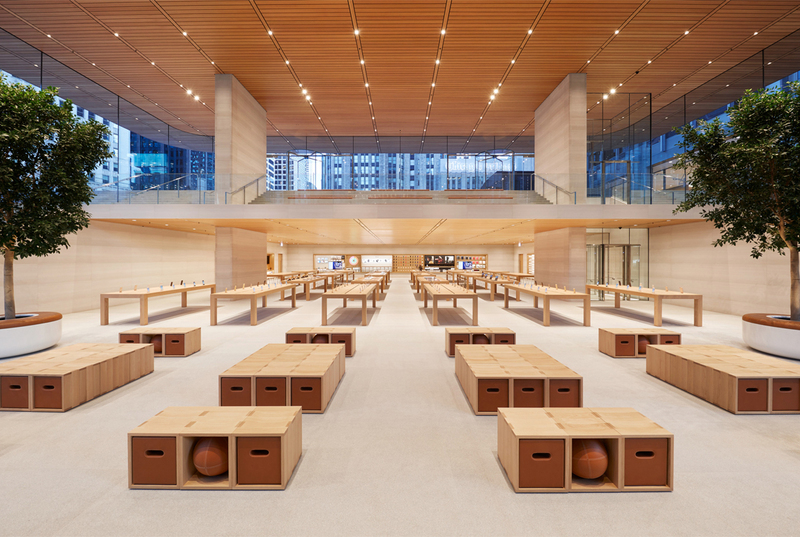 The newest addition to the design spectacle is the Norman Foster-designed Apple flagship store. 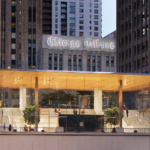 Billed as “the most ambitious” Apple store yet, Foster’s design utilizes an incredibly thin 111-by-98-foot Carbon Fiber Reinforced Polymer (CFRP) roof. Held up by only four columns, the roof is only three feet and four inches at its thickest. This allows for the 32-foot-tall glass facade to stand completely clear of structure. 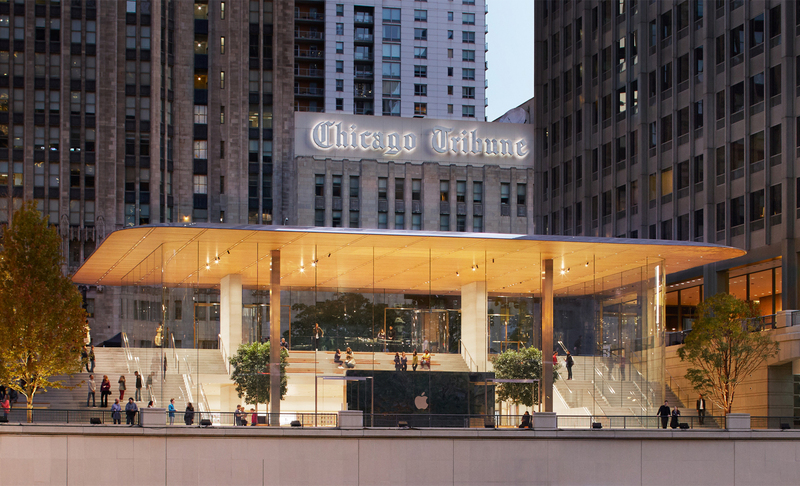 “When Apple opened on North Michigan Avenue in 2003, it was our first flagship store, and now we are back in Chicago opening the first in a new generation of Apple’s most significant worldwide retail locations,” said Angela Ahrendts, Apple’s senior vice president of retail in a press release. Since the 2003 opening, the earlier Michigan Avenue store has seen 23 million visitors. The new store hopes to better that with a closer connection to the city and the recently enlivened riverfront. 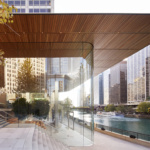 The project’s glassy facade and a large stair brings guests from the level of Michigan Avenue, down past lower Michigan Avenue, to a new section of the Riverwalk. 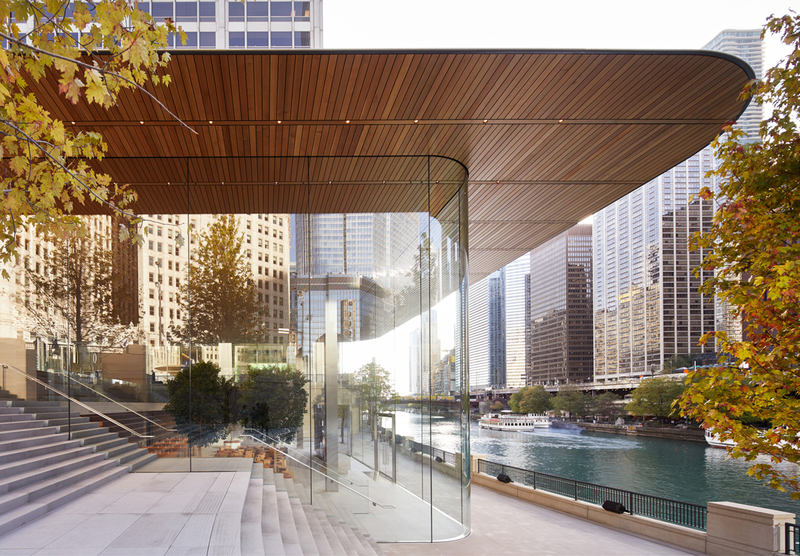 To celebrate the opening of the new store, Apple has launched a program called “The Chicago Series,” a set of events and demonstrations. These events will set the stage for year-round “Today at Apple” public programming that will take place at the store.